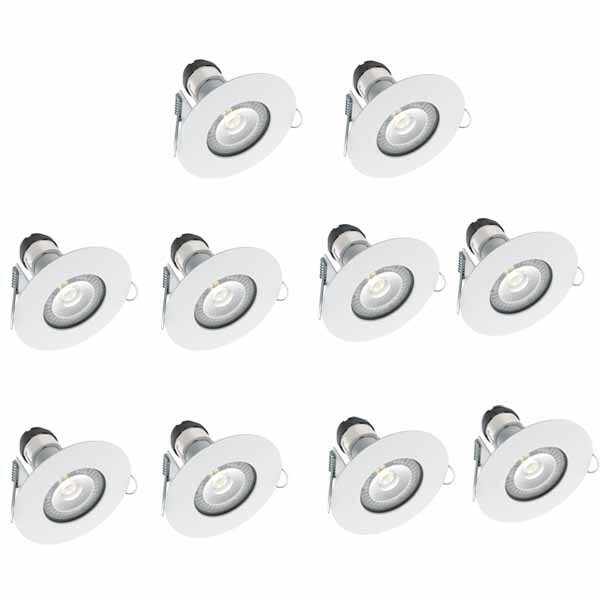 The low profile Integral EvoFire LED downlight 10 pack is supplied with a lamp, lampholder and terminal block so that it can be fitted quickly and simply. The benefit of a non integrated downlight is that the lamp can be replaced at the end of its life the fixture does not need to be changed as it does with an integrated downlight. EvoFire has the advantage that it is both fire rated and water resistant to IP65 meaning that it can be used in any room including bathrooms above showers. The 1mm bezel gives it a discreet, pleasing appearance when installed. We are offering a cost effective pack of 10 downlights. Please note these fittings come complete with matching LED GU10 4.5w non dimming lightbulbs.